"Four black and red salmon in a rectangle, with negative circles and crescents evocative of water waves. Every negative design element in this design symbolizes a salmon's harmonious life in its Pacific ecosystem. Salmon live with an instinctive vision harmonious with Pacific waters. The C-form eyes of the salmon have crescents flowing away from the eye, a real fluid flowing feeling, a real rhythmic rippling evocative of water drops in calm water. The stretched crescent mouth and crescent gill visualize the way a salmon brEAThes." 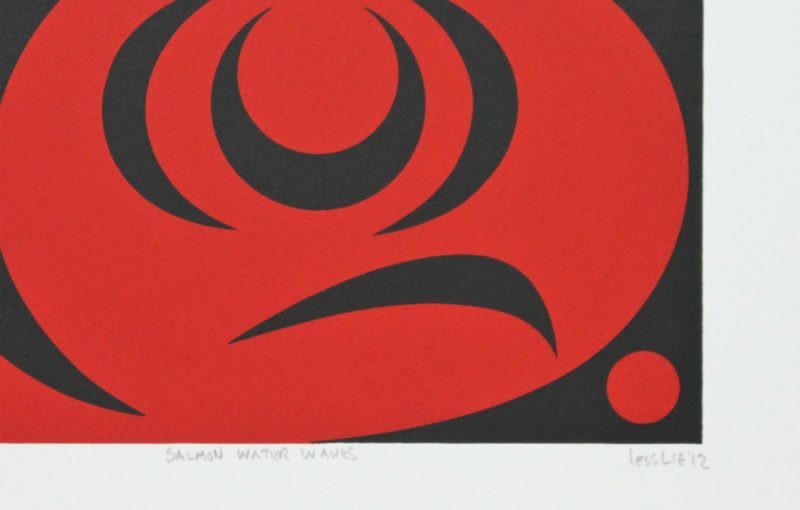 This limited edition silkscreen print titled "Salmon Water Waves" by lessLIEwas hand produced by the screen printing process. It is the only limited edition printing of this design. The artist has inspected and signed each copy in the edition. All trial copies of this edition have been destroyed and the printing stencils obliterated.